The rain forest is a big part of the world, but people are cutting them down. They are cutting them down to make highways and commercial logging. They are also cutting down trees because they need space for Mining, Planting crops and for cattle grazing. 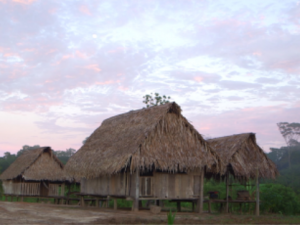 The effect of people cutting the trees in the rainforest down is that lots of people and tribes are losing their homes. Not only people but animals, they are killing the food web and messing it up, Which is messing with the food chain. The soil will grow poor in nutrient so they will only be able to grow crops there for a few years. Erosion is a big possibility if the cut down the trees. There will be climate change everywhere. When we cut down the rainforest we cut down homes, food, resources for animals like monkeys, tree frogs, snakes, bees, toucans and more. When we cut down the trees animals lose their homes so, the animal that lived there dies which makes the animal that ate the animal die and so on. We are messing with the animals food web. When we mess with the animals food web we are also messing with world population. When people cut down the rainforest they are cutting down half of the things they use in their daily lives. You lose fruits like mango, kiwi, pineapple and, more. Would you really want to live in a world without chocolate or gum? I know I wouldn’t. Do you like bland cake and coffee? Well we will have that if we cut down the rainforest, because the rainforest produces sugar. The rain forest produces medicine & the rainforest could hold a cure for cancer. The most important question is do you like living? Because you need oxygen to live and the rainforest produces oxygen. People are cutting down rainforest so here are some ways we can help prevent and save the rainforest that provides for us. We can recycle paper and boycott buying things that come from the trees of the rainforest. We can write to the congress and ask that they make a law to protect the rainforest. Saving the rainforest can easily be done with just donating money to an organization to help protect the rainforest. With rainforest that have already be cut down we can teach farmers to replant trees and selective tree harvesting and more. Thank you, I hope I helped! People are destroying the rainforest to build highways and roads. People are also commercial logging and mining the trees. They are going to have space for cattle grazing and ranching or farming. Once there are no trees to hold the soil the rain is going to wash away all the soil leading to erosion and without trees for transpiration the land will become a desert. Certain animals will become extinct because their homes are in the trees. Not only animals will be affected, people will too. The natives will lose their land. Animals that live in the rainforest may go extinct because of the trees being cut down. The animals homes may be in these trees. They will have nowhere to go to live because they will have no trees to live in. These animals that we may think won’t help us may actually help us later on in life. We will loose birds, and monkeys, frogs, snakes, and even jaguars. There are certain things that we will lose if the rainforest gets cut down. We can loose some very important things like medicine and food. We will loose fruits like mango pineapple kiwi and lemon. We will lose things like gum, avocados, cinnamon and sugar. we will lose oxygen too. In conclusion here are some ways to save the rainforest. You can establish a national park to help protect the forest or you can even educate people about them so they believe they shouldn’t be cut down. Don’t buy products that promote their destruction, recycle and donate money to organizations that help protect the rainforest. You can teach farmers about selective tree harvesting to plant trees where the other ones have been cut down. Ecotourism is another good idea to help. The rainforest in South America is being destroyed. They are destroying it for reasons. Some reasons are for cattle. Cattle will only be on there for 2-3 years before theres nothing left same thing with crops. People are also ruining the rainforests to build mines, Commercial loggings and highways. The cause of people cutting down the trees. Rainforest are getting cut down but some people aren’t very smart about cutting them down. They are ruining people’s homes. The soil will be nutrient poor without the trees. They also are ruining animals homes to and almost leading them to extinction. Erosion will happen because the trees hold the soil and dirt on place. The animals we might hurt also. When we destroy a tree we destroy a animal’s home. You might be making money off of it but you are actually ruining the circle of life. You are also making some animals almost go extinct. Some of these animals need the trees like; Boa constrictors, Monkeys, Tree Frogs, Jaguars, and Anteaters. If we cut down the rainforest then what will we have to eat. A lot of food comes from the trees of the rainforest. Also without the trees we wouldn’t be breathing or there would be not medicines. There could also be a cure for cancer in there. Ginger and Lemons and other great fruits and other great stuff are in there. We can save the rainforest by not using to much products that are made from it. We could also donate to the people that are trying to save or try to be part of it we as people are already part of the saving rainforest by recycling or donating money. I know that we can save the rainforest one day. Why are rainforests being destroyed People are cutting down trees for mining and for cattle grazing also to build roads for planting crops and also for commercial logging. That means less land of rainforest and people that live in the rainforest won’t have a home to live in. The sad part is that people don’t care what happens to the rainforest think again. The effects on the environment would be less air maybe no air at all. What may happen if the rainforest are gone. Places in the rainforest would be more dry than ever. The trees that are gone might have had a cure for cancer aids and many more other illnesses. And animals in the rainforest won’t be alive anymore they won’t have a place to sleep or eat if there is nothing for the animals to eat they will all die and maybe eat each other to survive. Animals that many not be alive anymore if we don’t save the rainforest. 50% of all the plants and animals live in the rainforest. If we keep on cutting down trees in the rainforest we are not going to have any fascinating animals. Like the snake, bees a tree frog, and a puma, that we may lose. If there is no trees in the rainforest the animals are going to die. Because they feed off of the leaves and the tree bark. All the animals won’t have a place to sleep a lot of these animals live up in the trees. Foods that are from the rainforest that we are going to lose. The resources that we are going to lose are Coconuts. in the summer when we want Coconut juice we won’t have any. We are going to lose Sugar witch that means no candy no Sugar in your coffy no sweet cakes. Another important resources that we are going to lose is medicines that may be in the rainforest in The plants and trees may have a cure for cancer, aid and many more other illness that can be cured. Rainforests are being destroyed by many reasons. There are five reasons for being destroyed are commercial logging, mining, planting crops, space for cattle grazing, and highways. Each of these reasons are bad because they are destroying places that we need. The rainforests are home to a lot of species but the rainforests are being destroyed. Some effects of the rainforests from being destroyed are native tribes are losing their homes, soil becomes nutrient pour, Erosion without trees water transpiration the land turns to a desert, extinction of species disruption to the circle of life. There are three things that might happen if the rainforests are being destroyed. The three reasons are increased greenhouse gasses, global warming, and climate change. Those three reasons are what would happen if the rainforests are destroyed because the trees can do a lot of stuff. When the rainforest gets destroyed many species like boa constrictors, bees, monkeys, toucans, and sloths. If the rainforests get destroyed that means most of the animals in the rainforests will die because they wont live. When these creatures are gone they would be extinct. If the rainforests are being destroyed we lose a lot of types of food. The foods that we would lose are avocados, sugar, pineapples, lemons, kola, coffee, mangos, cashews, oxygen, and kiwis. If we lose the rainforests we would lose all sorts of stuff like coffee. We lose some of the things that are important. Here are some ways to save the rainforests. The ways are not to buy products that help rainforest destruction, recycling paper, Write to congress and ask that they make laws that help protect the rainforests, Donate money to organisations that are trying to preserve the rainforests, Establish National Parks, you can educate the people, teach farmers how to replant trees, selective tree harvesting, sustainable rainforests products, ecotourism. If we don’t do that then the rainforests will die.